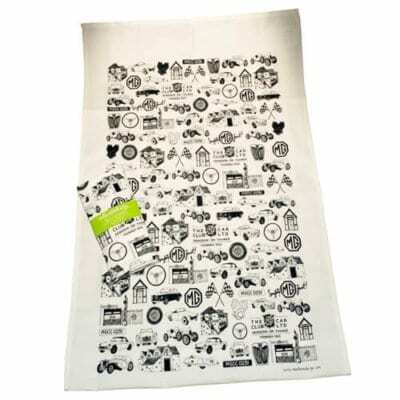 Classic MGB advert recreated as a hanging canvas. 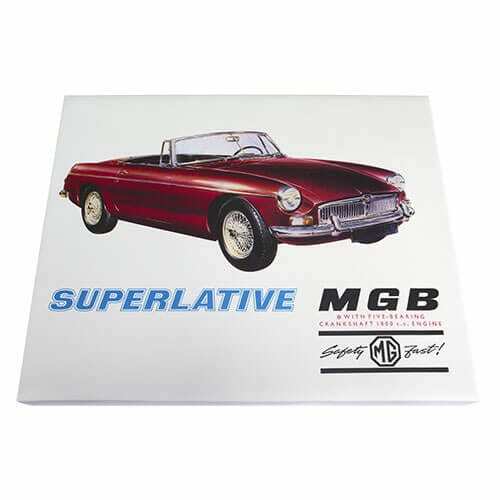 Featuring the ‘Superlative’ MGB roadster advert used to promote the MGB in the 1960s. 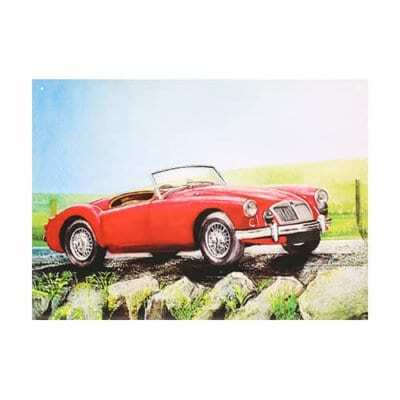 MGB Print 30th Anniversary 1962-1992, signed by Don Hayter. 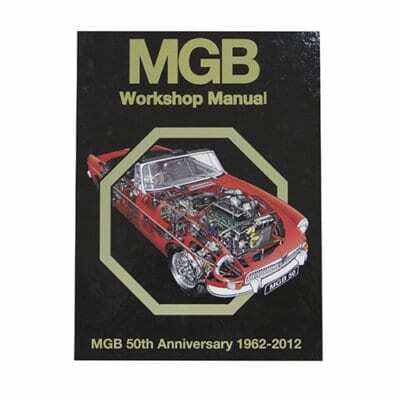 Written from hands-on experience gained from the complete strip-down and rebuild of an MGB in our project workshop, this manual can help you understand, care for and repair your MGB. We do it ourselves to help you do-it-yourself, and whatever your mechanical ability, practical step-by-step explanations, linked to over 900 photos, will help you get the job done right. Regular servicing and maintenance of your MGB can help its resale value, save you money and make it safer to drive. ‘MGB50: A Year To Remember’ on DVD A limited edition film of 1000 copies. The most professional, exciting and in depth film about the MGB ever made. MGB: The story: Multi-camera coverage of this brilliant seminar in Abingdon featuring Paddy Hopkirk, Alec Poole, Don Hayter, Bill Price, Den Green, Peter Browning, John Yea and Graham Robson. A fantastic night of memories and laughter which told the story of the MGB through the eyes of those who made the history. MGB 50th Birthday Celebration at Blenheim Palace interviews and features. Richard Thompson’s wonderful song ‘MGB-GT’: John was given special permission to use ‘MGB-GT’ by Richard Thompson. How the MGB was built: Former MG workers describe the building of MGBs at Abingdon. Using BMIHT archive footage, some of which has never been seen before, a really fascinating sequence. MGB 50 Celebration Race: Fantastic coverage of this one-off race using on-board minicams. Features an epic battle between MGB racers Malcolm Gammons and Jeremy Cottingham. MGLive! 2012: Silverstone’s MGB50 celebration, including the MGB 50 Birthday party, Graham Robson interviewing the MGB’s designer Don Hayter. Interviews with owners and coverage of other MGB 50 events MG LE50 Launch at NEC Show. Owner profiles: Real stories from owners who love their MGBs. A great gift for all occasions! 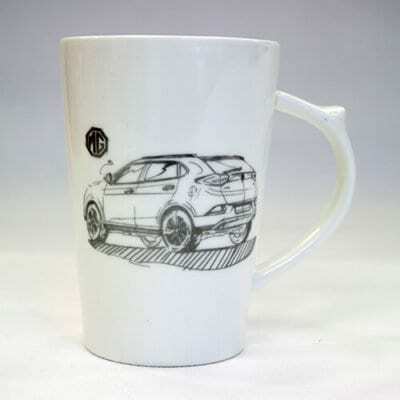 Ceramic mug featuring MG’s first SUV – the recently launched MG GS. 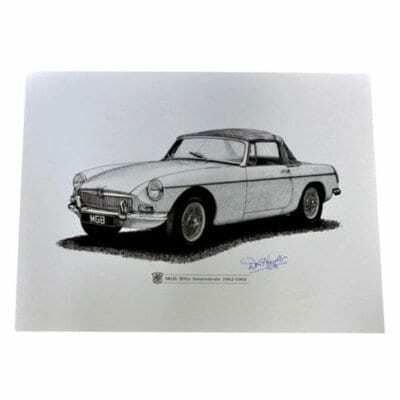 The car is shown in a silver/chrome style sketch, complete with MG logo. The rim of the mug features the ‘I Love MG’ logo and is supplied with a travel cup lid to allow you to take the mug on the go. 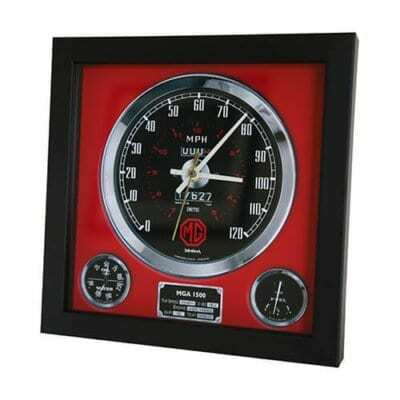 Hand made to order in Somerset and make the perfect present for the MG owner. The clock measure approx. 10″ x 10″ (24cm x 24cm) and is framed under glass in a stained wood frame.